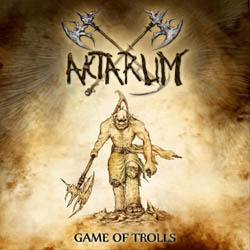 Belgian folk troll blackened metallers Aktarum have announced the release of their newest EP entitled “Game of Trolls“. The band was formed in 2005 and have released a demo in 2007, the EP “We Are the Trolls” in 2008 and their debut full-length album “Gang of Trolls” in 2010, all self-released. The band has shared the stage with most of the big names of the genre and more experienced than ever they started working on their new EP. Aktarum are now adding the finishing touches on the “Game of Trolls“, which will be released in a couple of months. They have just unveiled the beautiful cover artwork, illustrated by zero-scarecrow13, who also made a short album trailer that you can watch below. Final release date, album tracklist and more info will be revealed soon.